at Intermat in Paris. No less than four new machine models are introduced at once, together with a proprietary Brokk hydraulicbreaker range and three new concrete crushers from Darda. The four new machine models take the legendary Brokk power-to-weight ratio to new heights enabled by the unique Brokk Smart Power TM technology. The four new Brokk models are: the strong and light weight Brokk 170, th epowerful and flexible Brokk 200, the all-around top performing Brokk 300 and the green Brokk 520D diesel machine. The new BROKK 170 replaces the Brokk 160 in theproduct lineup. Taking the best from Brokk 160 and adding the full Brokk Smart Concept TM– the power of Smart Power TM, the reliability o fSmart Design TM, the ergonomics and productivity of Smart Remote TM– the Brokk 170 is the ultimate demolition machine fort he construction industry. With a 24 kW Smart Power TM electric power train, this lightweight machine comes with 15% more demolition power than its predecessor. It packs a mean wallop with the new Brokk BHB205 breaker and brutal crushing force with the new Darda CC440 crusher. Still, it retains the same compact physical dimensions as the Brokk 160 and the wide range of attachments are fully compatible between the two models. The all new BROK K200 defines anew weight class for demolition robots, filling the gap between the Brokk 170 and the Brokk 300. And it does so by squeezing the powe of a 3100 kg Brokk 280 into a2100 kg package, enabled by Brokk Smart Power TM technology. This 27.5 kW machine carries tools one weight class above its size and brings the hydraulic power to match it. Compared to its smaller sibling Brokk 170, the comes with the new Brokk BHB305 breaker that hits 40% harder and then ew stronger Darda CC480. The Brokk 200 has 15% longer vertical and horizontal reachwhile retaining most of the compact dimensions of the Brokk 160.The extra chassis length and machin eweight ensures excellent balance, even when wielding the heavier and more powerful attachments. All-in-all, the Brokk 200 represents the new standard in compact remote-controlled power– idealfor heavy dutybut difficult-to-access projects and applications. The all new BROKK300 is an impressive example of how quickly Brokk demolition robots evolve to meet the ever-increasing demands o fthe industry. Replacing the fairly recent Brokk 280 model, the new Brokk 300 comes with the morepowerful Brokk BHB455 breaker delivering 40% more hitting power. Equipped with the new generation of Brokk Smart Power TM technology , power output is increased to 37kW delivering the hydraulic flow and pressure to fully power the heavier and more powerful attachments it is paired with. Slightly longer than the Brokk 280 and weighing 500kg more, the Brokk 300 still retains the samewidth and height giving it access to the same confined work sites. A new arm system increases vertical and horizontal reach to an impressive 6.5 and 6.1 meters respectively. With impressive power, reach and stability, this model is destined to become another legend in the industry. Finally, the BROKK 520D establishes an ew standard for diesel-powered demolition robots with a larger hydraulic breaker that packs 40% more hitting power than the Brokk 400D it is replacing. This eco-friendly five-ton machine comes with two diesel engine options: a Stage 4/Tier4 Final Kohler unit meeting the new EU and North American emission standards, and a Kubota model available for the rest of the world. The new Brokk 520D is slightly heavier and longer than the old Brokk 400D, boasting a bigger BHB705 breaker and a 250mm longer work reach. Its heavier-duty boom system and increased hydraulic performance means that it can handle the same wide range of heavier, more powerful attachments that are already available for the Brokk 500 released last year. To top it off, the Brokk 520D also adds the clever improvements of Brokk Smart Design TM that will simplify daily maintenance and increase machine up time. 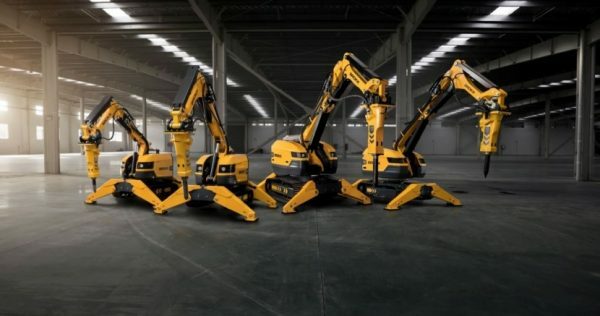 “The introduction of these four machines not only represents the biggest product launch in Brokk’s history, it also redefines what has been considered possibleto achievein terms of power-to-weight performance ratio for demolition robots. And this is all made possible by the unique new Brokk Smart Power TM technology. It is truly exciting to be able to say that after 40 years, Brokk still has the ability to redefine the industry. ”says Martin Krupicka, President and CEO of Brokk Group. These four new demolition robots from Brokk reflect the company’s constant focus on innovation, improved performance and increased up time for customers around the world. Each and every one of these new models brings state of the art in power-to-weight ratio and rugged reliability. Shipments of the new machines will begin in June-August 2018.